Bob Perry started his work experience on his family’s dairy farm which ran 24 hours a day, 365 days per year. In 1978 Bob entered into the EMS field as a Basic EMT, then in 1985 he advanced to the Paramedic level. In 2010 Bob became a Critical Care Paramedic. Throughout his time in EMS, Bob has always been eager to share his experiences and to help teach new EMS providers how to become the best at what they do. Bob is a very loyal person who fully commits himself to his family, work, and patients. He is upbeat and enthusiastic, and puts his patients first. Bob is always early for work, and maintains high ethical standards. While he is a medic, he is always willing and able to assist with whatever needs the company may have, he has been seen many times assisting chair car attendants and running chair car calls himself. Safety is one of Bob’s strongest points—he has never had an injury on the job in his more than 45 years of EMS service. 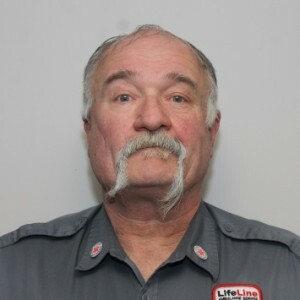 We could not be happier to have Bob as a part of LifeLine Ambulance Service, and want to thank him for his outstanding commitment to excellence.